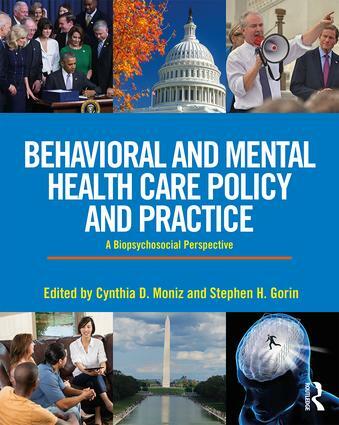 Cynthia Moniz and Stephen Gorin’s Behavioral and Mental Health Care Policy and Practice: A Biopyschosocial Perspective is a new mental health policy textbook that offers students a model for understanding policy in a framework that addresses policy practice. Edited to read like a textbook, each chapter is written by experts on an aspect of mental health policy.The book contains two parts: Part I chronicles and analyzes the evolution of mental health policy; Part II analyzes current policy and teaches students to engage in policy practice issues in different settings and with diverse populations. Cynthia D. Moniz is Professor Emeritus of Social Work and Department Chair at Plymouth State University in New Hampshire. Stephen H. Gorin is Professor Emeritus of Social Work at Plymouth State University in New Hampshire.